Let there be no misunderstanding here: Mulch is wonderful! Organic mulches help keep the soil cool and moisture, add nutrients and organic matter, deter weed growth and add esthetic value. However, in some cases a wonderful garden, or an area of a larger garden, can be perfectly healthy, happy and beautiful without ever seeing a bit of mulch. The key is filling space with greenery that is able to outcompete weeds. Stones can be artfully arranged to provide pockets of soil that then are filled to capacity with plants. This can be especially lovely in areas that are raised above the surrounding landscape, with the added benefit of improved drainage. This allows you to plant species that wouldn’t grow well in the clay soils that are so prevalent in parts of the metro area. 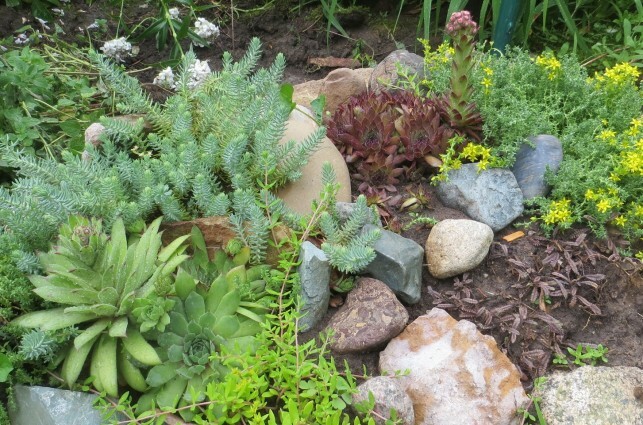 Among plants used more typically as groundcovers, some of my favorites are sedums, periwinkle, creeping phlox, wild ginger, some dianthus varieties, and low spreading evergreens like blue rug juniper. One thing to be aware of is that many groundcovers go where you don’t particularly want them, so it is important to consider the site and species factors such as how rapidly the groundcover spreads and how easy it is to control or remove. They say nature abhors a vacuum and, in general, so does your garden. The reason weeds invade is because there is room for them to germinate and grow, and outcompeting them with wanted plants helps keep them at bay. Most people think of low, trailing or blanketing plants when they think of groundcovers, but many plants are effective at dense coverage. You will find that you can create a whole garden with a variety of height, foliage and flower and see hardly a square inch of soil (or mulch!). The vegetation itself keeps the soil shaded and cool, though it may require a topcoat of compost every few years to add organic matter. Many species spread more easily without mulch, either vegetatively or by seed – but it’s more rewarding to be digging out and transplanting your favorite flowers than pulling dandelions!